"OLD BREED? NEW BREED? THERE'S NOT A DAMN BIT OF DIFFERENCE SO LONG AS IT'S THE MARINE BREED - LT GEN LEWIS B. "Chesty" PULLER - (13th PRESIDENT OF THE 1ST MARINE DIVISION ASSOCIATION) HIS FAMOUS CREDO WAS "Hi Diddle Diddle, Straight Up The Middle !" Landing with the 1st Marines at Inchon, Korea, in Sept 1950, he continued to head that regiment untill Janurary 1951, when he was promoted to brigadier general and named assistant commander of the 1st Marine Division. One of the Corps great legends. He holds the Navy Cross with Gold Stars in lieu of four additional awards - The ArmyDistinguished Service Cross - The Army Silver Star medal - The Legion of Merit with Combat "V" and Gold Star in lieu of second award - The Bronze Star Medal - The Air Medal with Gold Stars in lieu of second and third awards - The Purple Heart Medal. His other medals and decorations include the Presidential Unit Citation Ribbon with four bronze stars - The Marine Corps Good Conduct Medal with one bronze Star - The World War 1 Victory Medal with West Indies Clasp - The Hatian Campaign Medal - The Second Nicaraguan Campaign Medal - The Marine Corps Expeditionary Medal with one bronze star - The China Service Medal - The American Defense Service Medal with Base clasp - The American Area Campaign Medal - The Asiatic-Pacific Area Campaign Medal with four bronze stars - The World War 11 Victory Medal - The National Defense Service Medal - The Korean Service Medal with one silver star in lieu of five bronze stars - The United Nations Service Medal - The Haitian Medaille Militaire - The Nicaraguan Presidential Medal of Merit with Diploma - The Nicaraguan Cross of Valor with Diploma - The Republic of Korea Ulchi Medal withGold Star; and the Korean Presidential Unit Citation with Oak leaf Cluster. Pictured below: USNS Aiken Victory T-AP-188. After getting advanced combat training and winter manuvers at Camp Idlewild (San Jancento mountains) Camp Pendleton , our unit left on this ship out of San Diego harbor in early Februrary, 1951, along with the USNS Thomas Jefferson.Got into Kobe, Japan, dropped our sea bags off and sailed for Pusan, Korea. Pictured below: Jerry and I. Last days of winter combat training before unit left for Korea. Camp Idyllwild, San Jacinto mountains. (Camp Pendleton). Picture below: Aiken Victory crossing the International Date Line. (180th Meridian).The initiation of all Marines into the "Imperial Domain Of The Golden Dragon." As you can see, a very solemn ritual. Pictured below is George J. 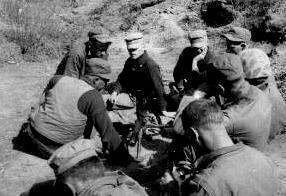 "Doc" Douglas - H&S Co. 2nd Bn 1st Reg 1st Marine Div.George was one of our Battalion's corpsmen. Was assigned with Easy Co. He saved many Marine lives, especially on the days of June 10-14 1951, near Hnagnyong, North Korea. Doc lives in Auburn, Calif. One of my very good friends. We still E-mail each other. Pictured below: Near the Hwach'on Reservior (June-1951.) My brother Jerry and myself. We were very lucky in that we got to stay together in China and later on in Korea. And thats good, when you have a great brother like I have. He is living in Miami, Fl. with his wife Helen. Pictured below: Danish Hospital Ship Jutlandia moored in Pusan Harbor (1951.) This ship was modern with 300 beds, 3 operating theaters a dentest clinic and X-Ray facilities. The Jutlandia remained there till 1953 following the end of hostilities. Two pictures below: Aiken Victory pulling away from dock at San Diego on way to Korea. Top, Jerry looking at camera. Picture below: Pusan, Korea. Jerry. Unit waiting to board transport planes enroute to joining 1st Marine Reg. 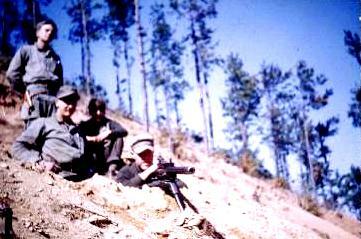 on central Korean front. Two Pictures below: 1. Pusan Korea - Line of departure for all "Jar Heads" (Note - Tanks on crest of hill. 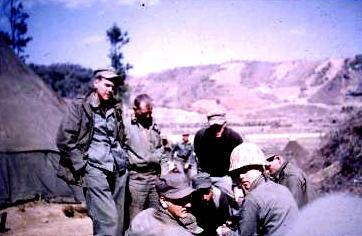 2.Pusan Korea - We stayed here one night, then joined the 1st Regiment the next day on the central front. Pictured below: Squad tearing down and cleaning gun. "Here's health to you and to our Corps, which we have proudly served"